Pet collars and leashes are some of those products that few consider converting to more sustainable options, because we don't really think of soft, pliable nylon or polyester as plastic. However, aside from the obvious plastic clips on collars, most collars and leashes are indeed made of plastic, with the same detrimental impact of plastic production and disposal. 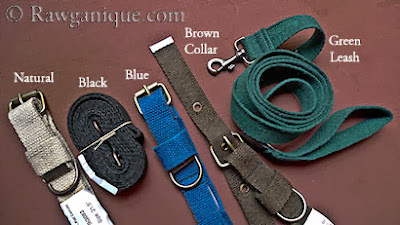 There are a number of companies that make wonderful, durable collars out of natural materials. Please note that the decorative ribbons used to embellish the collars with designs on them are made of synthetic materials. However, these companies are still supporting sustainably driven practices and hemp is an extremely durable base. Plus, they do offer basic products without any synthetics (just something to consider when looking at the decorative ones). Good Dog leashes and collars are made in the USA with industrial hemp and certified organic cotton. They offer collars and leashes in a number of sizes and styles from toy dogs to large breeds, as well as harnesses, cat collars and affordable hemp dog toys. We owned the corduroy style and it lasted for many years before needing replacing. When it was time to replace our leash recently, we'd started using a martingale collar so we gave earthdog a try. They have a huge selection of beautiful designs in their decorative hemp collection, and great colors in their solid hemp line, which is what we opted for. They are extremely durable and soft and I anticipate both the collar and leash to last for many, many years to come. Earthdog not only makes dog collars, harnesses and leashes, but they also have hemp toys and hemp pet beds and blankets. All of their products are made in the USA. Green Bean creates collars and leashes in numerous fun designs, as well as several cat collars. The webbing of the dog collars and leashes is made with 100% hemp and the cat collars are made with 100% cotton. The ribbon is grosgrain and all the products are handmade in Santa Barbara, CA. I love, love, LOVE the fact that these collars have metal clips! They are handmade and come in tie-dyed designs as well as few other variations like the ones pictured here. There are also braided hemp rope leashes available. Rawganique products are made in Europe and even the hemp is sourced from Europe. They have traditional styles pictured here, as well as colorful braided hemp collars and leashes. Planet Dog does offer hemp collars and leashes, however, they are lined with a polyester fleece and they are made in China. What I LOVED from their "Eco Friendly" section was this ball chucker made of bamboo and cork scraps. It can be purchased with or without the recycled plastic ball. Pet Supplies so amazingly. I loved all your styles but the patterns of earth dog are quiet impressive. I am going to try it for my dog as well.